It's been a tough week for gold bulls of all stripes. Gold prices today (Friday) are mostly flat, up just 0.62% in afternoon trading. This week, the Fed went ahead and raised rates by 0.25%. No surprise there. Effectively, the fed funds target rate has now moved up to a range of 0.5% to 0.75%. While the Fed did follow through with an increase, keep in mind that these rates are low. Historically, they're still extremely low. Nonetheless, the short-term reaction in gold prices has been negative. Up until the Fed's rate hike announcement was official, the price of gold was still trading at $1,161 an ounce. Within just two hours, it had dropped to $1,142, then fell a little further on Thursday. As I write, gold is down by another $12 to $1,130, losing 17% since peaking this summer. Existing bonds, which already pay a fixed coupon, are in a challenging environment, too, because increasing rates compete with them. So long-term bonds are tanking and have been since July. On the other hand, a rate hike has helped boost the U.S. dollar, which now pays higher short-term interest. And a higher dollar, at least in the near term, weighs on gold priced in dollars, since it takes fewer of them to buy the same ounce. While that's a relationship that holds true over the short term, the longer term says something different. 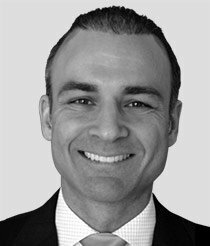 There have been numerous periods (think late 1970s, early 2000s), lasting months and even years, when gold prices and the dollar have risen together. 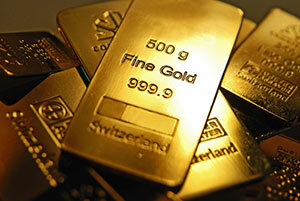 The gold price ended the previous trading week on Friday, Dec. 8, dropping by about $10 to close the week at $1,160. On Monday we saw a small reversal, as gold prices opened at $1,155 and climbed to close at $1,162. Tuesday saw a weaker open at $1,159, and after some bouncing around closed almost breakeven at $1,158. Of course Wednesday brought out the fireworks. That's when the Fed confirmed the awaited rate hike, swiftly tanking gold prices by $19, which followed through on Thursday. That's when gold hit an intraday low of $1,123 but recaptured some to close at $1,129. 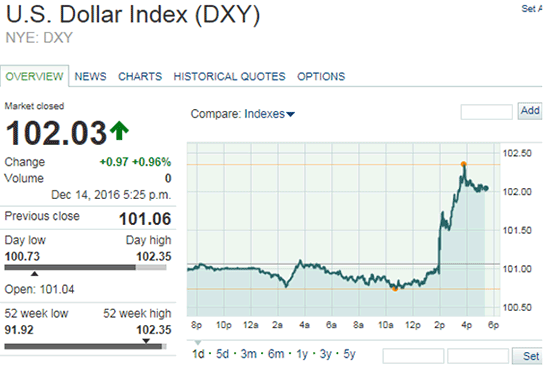 And here's what the U.S. Dollar Index (DXY) did over the past five trading days. It was a stunning surge that began right after the news of the rate hike and bled well into Thursday, taking the DXY up nearly 250 basis points from Wednesday's low to Thursday's peak. That, of course, was a formidable test for gold to counter. Gold prices today are mostly flat, sitting at $1,135 in early afternoon trading.